This Thai ginger carrot soup is super comforting, healthy & ready in 30 minutes if you use a pressure cooker. The flavours are bold, the texture is creamy, the recipe healthy and it becomes a complete meal if you top it with some noodles! I apologise if its not soup season in your part of the world but we are experiencing what we call ‘Bangalore weather’. Which basically means that it’s pleasant enough to pass on the salad and skip to soup instead. 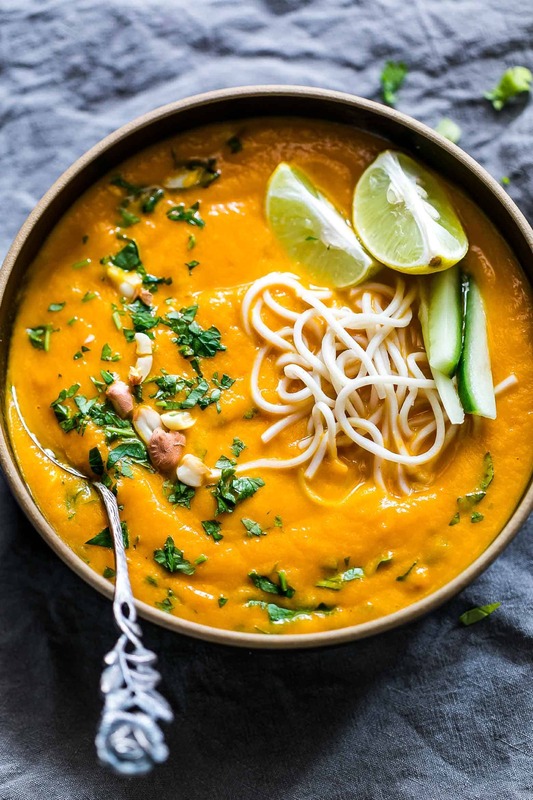 And I’m not complaining either because I’m in love with this utterly delicious Thai ginger carrot soup that takes all of 30 minutes to make. And is the most satisfying thing in the world right now. I made such a big batch on Tuesday that I ate it for three days straight, and now that it’s over I’m wishing it wasn’t. 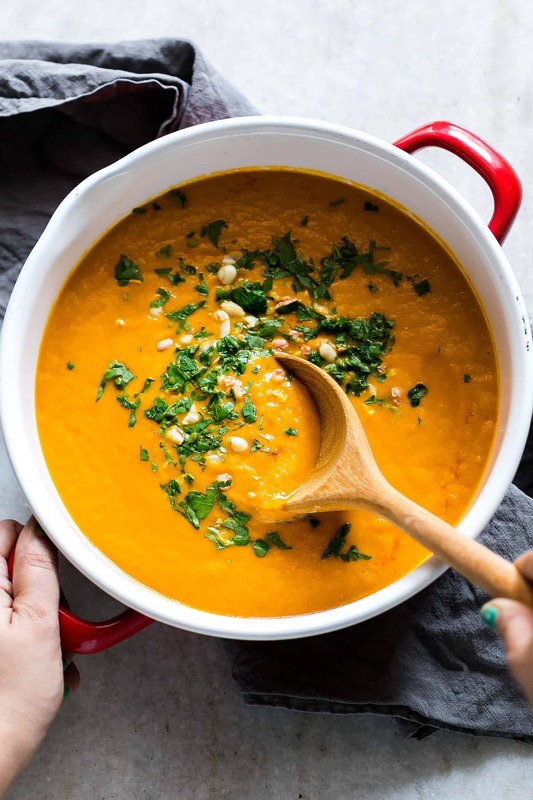 Recipes like this carrot soup are such a must have in your backpocket. 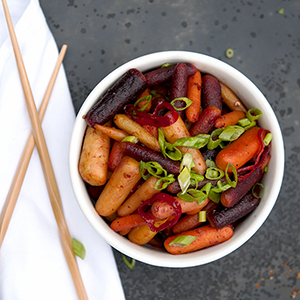 Because when you have nothing in your refrigerator except ginger, carrots and onions, you can whip this up. And dinner is ready. Or lunch. Or a snack. It never fails to satisfy. Also I made this Thai ginger carrot soup in the pressure cooker. Which makes cooking this super easy. And if you have an immersion blender, this carrot soup also becomes one pot, because you can just blend everything in the pot. 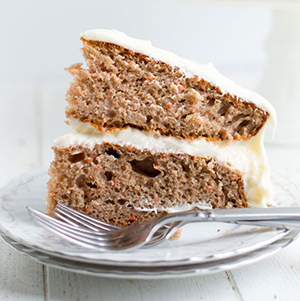 This is one of those recipes that gives me the warm, fuzzy feels. You get yourself some in a mug if you want to warm your hands while you sip on it (yessss that feels sooo good), or pour yourself a ladleful in a bowl, and top it up with some noodles or rice + crushed peanuts + chopped cilantro + big squirt of lime juice, and you have a meal thats suddenly phenomenal and comforting at the same time. Are you getting the feels too? BTW if you have an electric pressure cooker or an Instant Pot, this only takes 15 minutes to make which is even faster than 30 minutes. 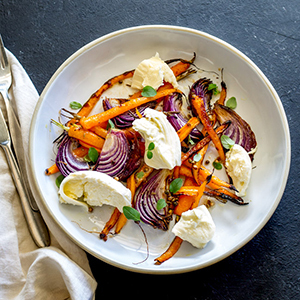 Which is pretty amazing for a thick, creamy and healthy meal that can feed the entire family! 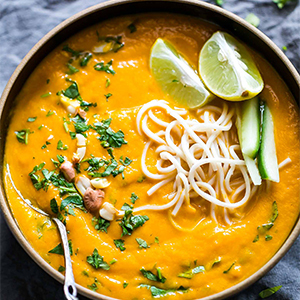 Can you make this Thai ginger carrot soup on the stovetop instead? Absolutely, all you have to do is saute the thai red curry paste in a little oil, and then dump everything else, along with water or broth and simmer everything till the carrots are tender. Once it cools a bit, blend and enjoy! Also, before I go, I have to mention this. Denver’s reaction when I told him there was carrot soup –> 🤢🤢🤢 and Denver’s reaction after he tasted this Thai carrot soup –> 👌👍🙌👏👅 so this carrot soup is vegan, healthy, spicy and husband approved. 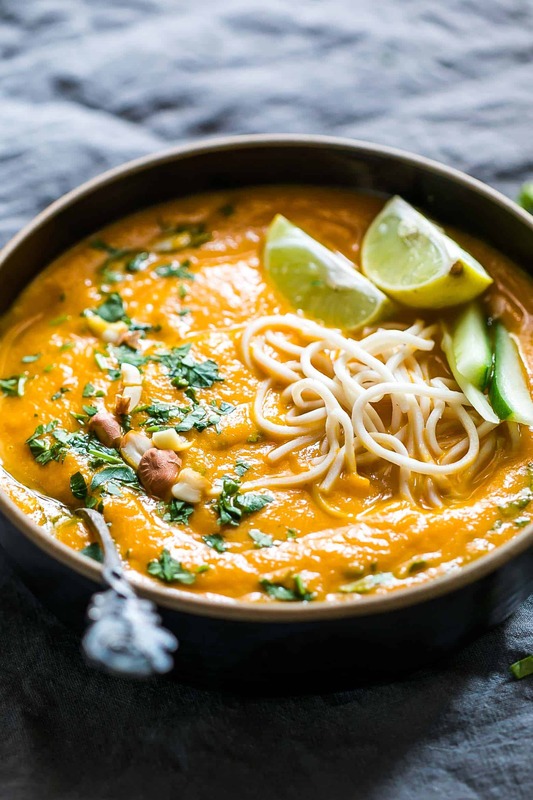 This Thai ginger carrot soup is pure comfort food and is ready in under thirty minutes if you make it in a pressure cooker. The flavours are bold, the texture is creamy, the recipe healthy and it becomes a complete meal if you top it with some noodles! Traditional Pressure Cooker: Heat oil and add the red thai curry paste, ginger and onions for a few minutes. Add the carrots, water (or broth) and salt. Bring the pressure cooker to high pressure and cook for three whistles. Turn it off, and let the steam release naturally. Mix in the peanut butter and then blend using an immersion blender or wait for the soup to cool a bit before blending. Top with your favourite topping and serve hot. Instant Pot or Electric Pressure Cooker: Saute the red thai curry paste, ginger and onions in oil for a few minutes. Add the carrots, water (or broth) and salt. Set on high pressure for 12 minutes, and then do a quick release. Mix in the peanut butter and then blend using an immersion blender or wait for the soup to cool a bit before blending. Top with your favourite topping and serve hot. Stovetop Method: Heat oil and add the red thai curry paste, ginger and onions for a few minutes. Add the carrots, water (or broth) and salt. Bring it to a boil and then simmer till the carrots are cooked through and soft. Mix in the peanut butter and then blend using an immersion blender or wait for the soup to cool a bit before blending. Top with your favourite topping and serve hot. Do you simply peel the entire ginger piece and use those slices? Hello–We have peanut allergies in my family. I know, I really miss it. How is the omission of the peanut butter going to affect the taste of the soup? I will be adding it to my serving, but I am the only one not allergic. Is there a non-nut alternative to add? Hey Joan – try adding almond butter instead if that works. It’s not a true alternative, but it will add a similar nutty flavour. Is there a certain kind of noodle you recommend for topping? 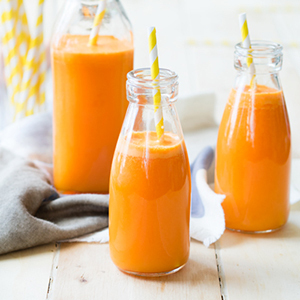 Easy to make, healthy and delicious! Couldn’t ask for more! 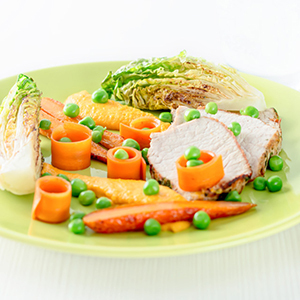 I have made quite a number of recipes from your site Richa and they have been great. Thanks for making cooking fun!